The waters of Alaska feature five types of salmon: King Salmon, Sockeye, Coho, Pink & Keta. King Salmon, also known as Chinook, are the largest of the salmon family and is a prized sport fish. 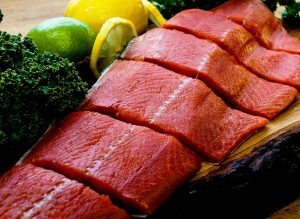 Sockeye, also referred to as Red Salmon is the second most abundant of the species and the most sought after by finer restaurants and discriminating chefs for its distinct deep red flesh and flavor that brings dramatic impact to any presentation. Coho Salmon, also called Silver Salmon, has an orange-red flesh and is utilized in frozen, canned and smoked preparations. Pink or Humpback Salmon are the most abundant and smallest of the Alaskan salmon varieties and have a very mild flavor and can be found mostly in canned products. Keta also known as Chum, have an orange-pink flavor and are best utilized in smoked and canned preparations.